Created for adults seeking entry level employment. The idea is that while their supervisor use imperatives to them, they should be careful about using imperatives to co-workers and employers. The present downloadable printable is meant for adults at Pre-intermediate (A2) level. 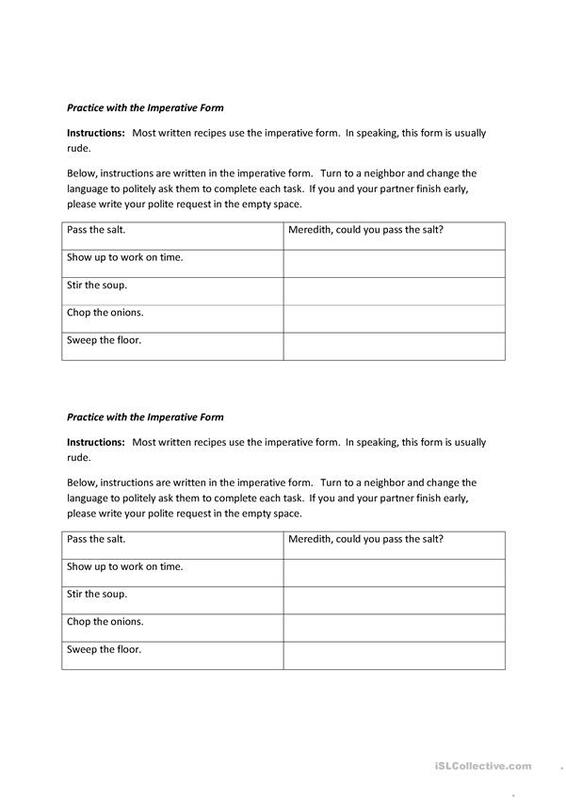 It is great for consolidating Commands (imperatives) in English, and is a valuable material for honing your students' Listening, Speaking and Reading skills. mekewilson is from/lives in United States and has been a member of iSLCollective since 2011-11-21 22:38:23. mekewilson last logged in on 2013-10-01 08:30:30, and has shared 4 resources on iSLCollective so far.